The Chevy Volt is a hybrid car produced by GM. Unlike the Prius it uses lithium-ion batteries and can run on only the electric motor for an extended period. The 149 HP electric motor can propel the vehicle to 101 mph and after the 16 kWh battery is depleted the gasoline engine switches on to provide energy for the motor and can couple itself to the wheels directly when above 70 mph. The Volt, like any automobile with a 16 kWh battery or larger, is eligible for a $7,500 tax rebate when purchased. One study claims that the car costs taxpayers the equivalent of $250,000 per vehicle. GM has announced that the car is being phased out. Production will end in March 2019. Volt owners have the highest rate of owner satisfaction of any new car in 2011 and 2012. 93% of Volt owners would purchase the car again. From a list of the top best-selling vehicles sold during the 2012 model year, the Volt was ranked 133 out of 262. GM says the Volt is a niche car but will serve as a technological test bed for future advanced technology. While current owners appear most satisfied, the general public has little interest in electric vehicles. Of the 15 million cars sold in 2012, only 100,000 were electric. A grand total of just one tenth of one percent of all cars. For environmentalists, electric automobiles appear to be the car of choice. In reality, it's not a game changer for the environment as liberals would have you believe. A reliance on electric automobiles, electricity commonly generated by coal power, does not offset emissions. Even if half the auto market was comprised of electric vehicles, emissions would not be affected. Volt sales started slow with only 326 sold in 2010. 2011 saw a modest increase in monthly sales with a yearly total of 7671. An increase happened in 2012 with 23,461 sold though 2013 sales have leveled off at 23,094. Sales were strongest in California, approximately 50% of all sales. Given the weak sales, GM may never recoup the car's $1.2 billion development costs, a claim GM vehemently denies. General Motors collaborated with the International Association of Fire Chiefs (IAFC), International Association of Fire Fighters (IAFF), Illinois Professional Firefighters’ Association (IFPA), National Emergency Number Association (NENA), and the National Fire Protection Association (NFPA) to train first responders in handling the peculiarities of electric vehicle accidents. GM also created an emergency response guide for emergency professionals and public use. The National Highway Traffic Safety Administration concluded the Chevy Volt does not constitute a fire safety risk and is quoted as saying, ‘no discernible defect trend exists’ after investigating a battery compartment fire that started two weeks after a Volt was destroyed in a crash test. GM has responded further by modifying existing and future Volts to better withstand crashes in the future. Batteries on several Chevrolet Volt cars caught fire. A coolant leak was the reason given by GM. Battery degradation is seriously flawed, dropping as much as 57% in very cold weather and by 33% in extreme heat. This affects all electric vehicles, not just the Volt. ↑ "2014 Volt Models & Specs"
↑ "First Test: 2011 Chevrolet Volt", Motor Trend, Dec. 2010. 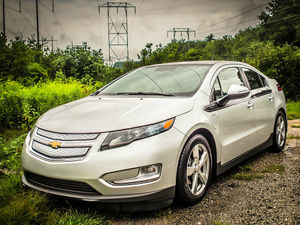 ↑ "The Chevy Volt Is A Dream Car And Now GM Is Killing It". ↑ "GM's losses up to $49,000 on each Volt", Reuters, 10 Sep 2012. This page was last modified on 9 April 2019, at 01:33.